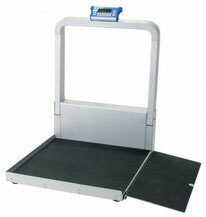 The DS8080 portable wheelchair scale provides a big low profile base that makes weighing patients quick and easy. 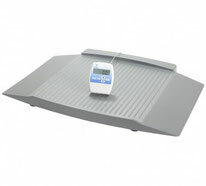 The scale's platform is made of heavy gauge painted steel and is covered with a textured, heavy-duty composite plastic cover that provides an anti-skid surface for maximum safety. The molded surface doesn't have any seams to trap dirt and dust and is easy to clean. 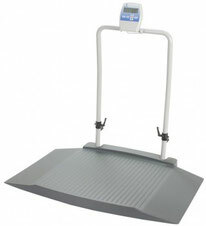 The Model DS8080 portable wheelchair scale features a digital readout that can be placed on a tabletop with its integrated stand, or mounted on a wall.